This week has been eventful, browsing through the last few blog entries you will see; an introduction to keyboard cat; Apple's WWDC 2009: which included MacBook Updates, Snow Leopard and iPhone 3GS announcements; the London Tube strike which caused travel chaos; Real Madrid's transfer activity [so far]; England cruising through the World Cup qualifying campaign [so far] and tonight we have the Facebook landrush for the Vanity URL's. Also for good measure we have just purchased a Pomeranian puppy and at some point this evening we are about to hit a Twitpocalypse. Well at least that's what it's being called as every tweet has a unique numeric identifier and tonight we're going to reach the limit. This identifier is about to hit 2,147,483,647 and when that happens it's going to be chaos in the streets, riots and the end of mankind as we know it [/sarcasm]! According to sources this is likely to affect third party Twitter clients so shouldn't have a considerable impact. 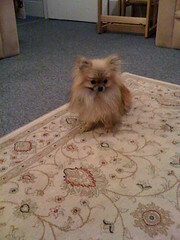 Anyway back to the Pomeranian, who we have named Teddy, and he is a cross between a Furby / Mogwai. He's very cautious at the moment but he's going to break some hearts that's for sure as he is definitely cute!! I'm going to catch some sleep now, I have set my alarm for the Facebook Vanity URL launch which takes place at 5:00AM GMT and I'm also interested in what will occur when the Twitpocalypse is upon us!